A Massachusetts judge decided that there was more going on than meets the eye between Norwood, Mass.-based Clay Nissan and Jill Colter, a service department employee who was fired from the dealership in the midst of cancer treatment. On Monday, Colter's brothers, Adam and Jonathan, were ordered by the court to pay Clay Nissan $1.5 million for their role in initiating what the judge deemed a very damaging wave of negative attention toward the dealership. In the end, the dealership lost hundreds of thousands of dollars in business and suffered a barrage of angry correspondence over the summer. The superior court judge not only ruled in favor of Clay Nissan when the dealership sued the Colter family for what it said was a social media-based smear campaign, but ruled that the Colters' internet based call for a boycott of the dealership was defamatory. According to court documents, Jill Colter's firing had nothing at all to do with her illness, although her brother Adam contended that the dealership had a regular practice of firing employees with cancer. Of great significance to the court, when pressed by counsel for Clay about his assertions that Clay had fired others because they had cancer, Adam Colter insisted that he had received e-mails from other former employees of Clay who had informed him that they had been fired by Clay because they had cancer. He insisted that he just needed a moment to look at his phone to retrieve the e-mails. When granted that opportunity, he did not produce those e-mails, claiming that they were on a different account that he could not access off his phone. The court gave Adam Colter a week to submit the e-mails, which he never did. The judge concluded that the e-mails didn't exist. Last time we wrote about the Clay-Colter controversy, Scott Clay, President of Clay Nissan of Norwood, told us that even though Jill Colter had been fired because her managers decided that she was difficult to work with, he offered her job back the same day he found out about the firing. "...we decided that her firing was not in keeping with the way our family has run this company for over 60 years," he said. The judge decided that Colter's manager had been well within her rights to fire Colter. During the pendency of this matter, the Colters have been exposed to many additional facts that would cause a reasonable person to conclude that Jill's termination was not based in any way upon her illness. The Colters have chosen to ignore those facts and have stepped up their relentless campaign against Clay. The Colters' campaign against Clay apparently worked. The dealership received many angry and threatening e-mails and letters, and endured at least one organized picket. 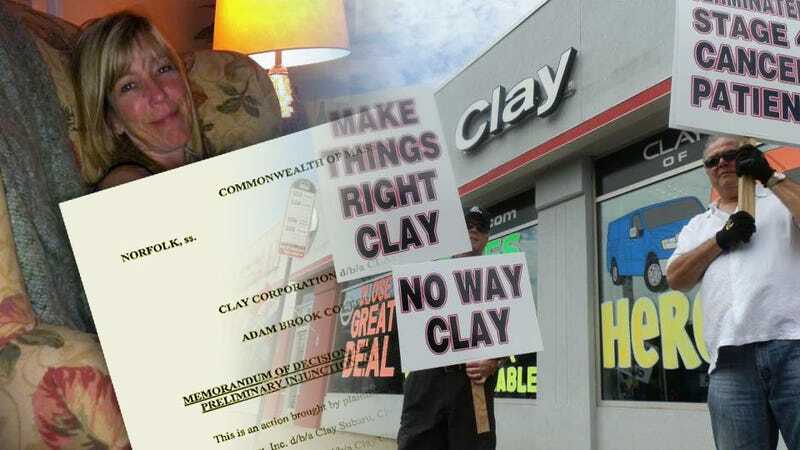 The court found that Clay's sales over the summer took a major hit from the Colter's calls for protests and a boycott (the family's "Boycott Clay Nissan" Facebook page has more than 37,000 "likes"). In July alone sales dropped by $100,000. We reached out to Jonathan Colter — who spoke with us last time we reported on the Colter firing — but he did not respond by publication time.